The Mandans were members of the Siouan family, which gets it's name from the Sioux. 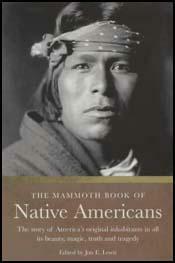 The Mandans lived in villages along the Missouri River in North Dakota. They were farmers and crops included corn, beans, squash and tobacco. They were also buffalo hunters. Every part of the buffalo was used. They provided them with food (meat), shelter (buffalo skin tipi covers), clothing (hide robes), fuel (dried buffalo dung), tools (horn spoons and bone hide scrapers), weapons (buffalo hide shields and bow strings) and equipment (rawhide envelope for storing food). In October 1804 members of the Meriwether Lewis and William Clark exhibition encountered the Mandans. They gave a friendly reception to the explorers and were extremely interested in trading goods. They also took members of the party on a buffalo hunt. Lewis and Clark unsuccessfully attempted to negotiate a peace treaty between the Mandans and the Arikara. Maximilian, Prince of Wiedneuwied and Karl Bodmer explored the lands of the Mandans in 1833. Bodmer, a talented artist painted the portraits of Blackfeet leaders. The Mandans were also painted by George Catlin. The Mandan people lived in circular earth-covered lodges. The centre of the roof was supported by four stout posts. There was an opening in the middle of the roof for the exit of smoke. On average, 10 people lived in each lodge. Each village had about forty or fifty lodges. The population of the Mandan people was reduced drastically by a smallpox epidemic in 1837. It is estimated that numbers fell from 1,600 to 150. In 1870 survivors of the Mandan and the Arikara were placed in the Fort Berthold Reservation along the Missouri River in North Dakota. Among others who visited us was the son of the grand chief of the Mandans, who had his two little fingers cut off at the second joints. On inquiring into this accident, we found that it was customary to express grief for the death of relations by some corporeal suffering, and that the usual mode was to lose two joints of the little fingers, or sometimes the other fingers. The wind blew very cold in the evening from the southwest. Two of the party are affected with rheumatic complaints. In the course of the day one of the Mandan chiefs returned from captain Lewis's party, his eyesight having become so bad that he could not proceed. At this season of the year the reflection from the ice and snow is so intense as to occasion almost total blindness. This complaint is very common, and the general remedy is to sweat the part affected by holding the face over a hot stone, and receiving the fumes from snow thrown on it.